In our last commentary in April we warned it was time to pay attention to risk. Since then global equities have suffered steep declines, with S&P 500 losing -6.7% and the International EAFE index falling -10.0% at their worst levels. Where is the opportunity now? I think it’s safe to assume that when Yogi Berra uttered his famous statement “It’s like Deja Vu all over again” he was not referring to the effects of fed intervention on financial markets. But he couldn’t have been more right. Over the last 3 years markets have been subjected to several rounds of Federal Bank intervention, all in an effort to stabilize the economy and return to growth. These actions have been given a variety of exotic names: TARP, TALF, Quantitative Easing I and II, and most recently, “Operation Twist”. The problem with any Fed intervention is that temporary stability is almost always followed by a return to volatility. In medical terms Fed intervention is more akin to a shot of adrenaline, rather than a long term cure. Once the intervention program has run its course, markets are forced to confront the same issues, usually with few new solutions. Since beginning in 2008, each round of Fed intervention has had a diminishing effect on markets. Last summer European markets were in free fall. In the last few trading days of November, European banks joined the intervention party with their own version of Quantitative Easing called: “LTRO”. The effects were immediate, putting a floor in falling prices and providing the liquidity for a global rally in equities. Estimates for the cost of LTRO approached $1 Trillion. Now the European stimulus strategy is facing the same fate as the other US interventions. 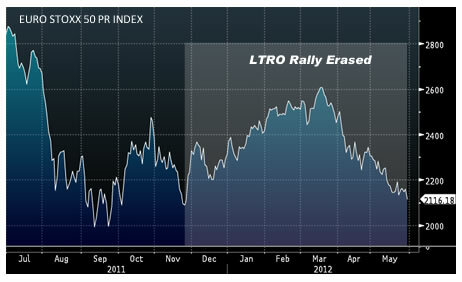 Just five months after embarking on LTRO, the entire rally has now evaporated. With the adrenaline rally over, markets must consider the same realities that were present in November 2011 when European equity prices were in free fall. The manic price action this year is not a surprise to us. We have been commenting over the past 18 months about the effects of intervention on markets, and positioning our Long-Short high yield: Alternative Income and Global Long-Short Equity: Alpha Trend Strategies portfolios to benefit. While the climate may be challenging for those without the ability to hedge, it remains an ideal environment for Anchor Capital. Over the next few weeks we will have more to say about the substantial opportunities we see coming for long-short credit strategies. For now however its all about Operation Twist. 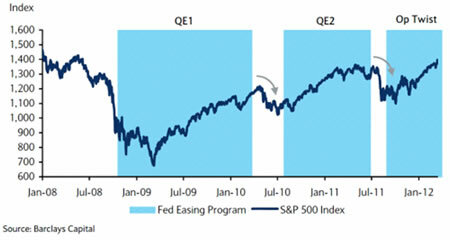 Within weeks of the Fed’s QEII program ending last June 30, 2011 stocks fell 13% in the proceeding three months. With Operation Twist set to expire in just four weeks on June 30 2012, we will be watching closely to see if it’s Deja Vu All Over Again.